Die-Stamped & Forged Rings - Dexter rings are all made from this process. This skilled process begins with a sheet of highly compressed gold, from which the flat profile of the signet ring is stamped. The stamping process is done with a die under great weight, which in turn compresses the gold further, making the material incredibly dense. The flat profile is then forged by a skilled goldsmith into a blank signet ring. The forging again hardens the precious metal, resulting in an incredibly strong signet ring, with a superb finish. Not only is the die stamped ring visually superior and durable, but provides the perfect base for engraving. The dense, compressed precious metal will lend itself to a more precise cut, giving your signet ring a sharper, defined engraving. We trust our high quality rings will look as beautiful today as they will tomorrow, an heirloom to be passed on to future generations. 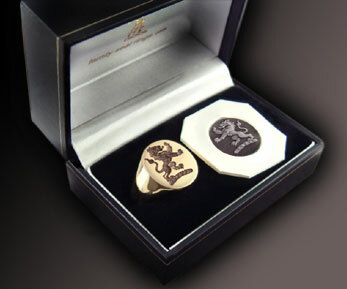 This is why we use the very finest die-stamped & forged signet rings for our engraving. Cast Rings Some suppliers offer cast rings - These are made by pouring molten metal into a mould. Like all cast products, these rings are inherently porous, which will lead to a poor finish with visual imperfections. These products are often extraneously decorative, the detailing used to mask the imperfections. Cast rings are comparatively weak which will lead to wear issues, and even failure. The alternative prefered method of producing a signet ring is by die-stamping and forging. see bespoke gallery or more about dexter: buying guide | about dexter | engraving styles | heraldic experts | why hallmark?